Be warned, there are SPOILERS AHEAD. Spoilers about costuming, big plot points, character deaths, etc. So turn back now and do not @ me. OK, you're still here, so you know that Lady Olenna, the biggest badass in the great game, died in this week's episode of Game of Thrones. While Tyrion assumed Cersei would defend Casterly Rock against the Unsullied, Jaime and his army overtook the Mother of Dragons' ally. ...and, in her final moments, she let Jaime know that she was the one who murdered his son, King Joffrey, during his wedding to her granddaughter, Margaery. Iconic. Savage to the end. But as cool a mic drop as it was, let's take a moment to talk about how sad Lady Olenna's arc was this season — and how her costuming reflected that. 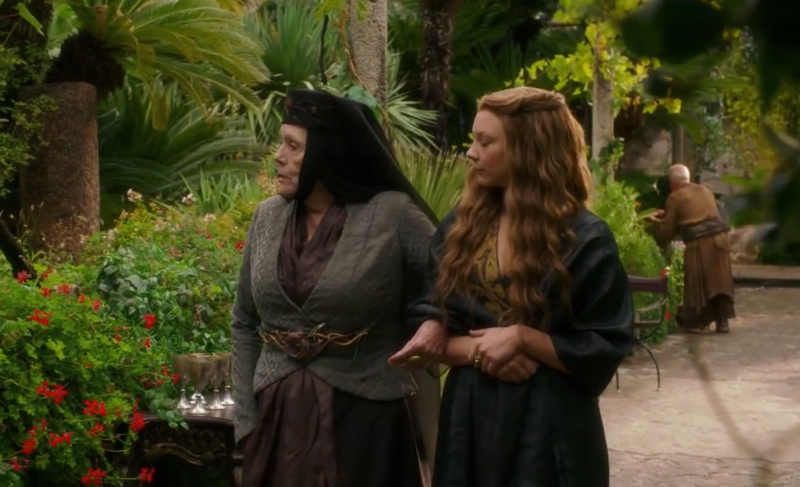 In past seasons, we saw Lady Olenna wear colorful headdresses that seemed to mirror her allegiances, like Sansa does. She often wore the pale blue associated with House Tyrell (like Margaery), which, according to costume designer Michele Clapton, created a jarring contrast to the reds of House Lannister. But she also often wore gold, which is a shared color in both the Lannister and Tyrell sigils (a lion and rose, respectively). But since Margaery and Loras died at the end of Season 6 when Cersei blew up the Sept of Baelor, we've seen Lady Olenna only in all black, wearing one simple black headdress embroidered with the signature Tyrell roses. The last time we saw her in her signature blue/gold was during her heartbreaking final meeting with Margaery — aka the last time the Tyrell bloodline was still alive. But Cersei murdered Lady Olenna's son, her grandson, and her granddaughter, wiping out the future of House Tyrell. And her all-black mourning garb seems to reflect that loss. We saw Lady Olenna wear the black headdress after Joffrey's death — but she wasn't in full mourning, obviously, so she wasn't in head-to-toe black. She was dressed in muted colors, but still had some subdued Tyrell blue in there, and donned that fabulous rose belt. And she was wearing the very same black headdress when she told Margaery she was the one who killed Joffrey. Maybe it's a coincidence. 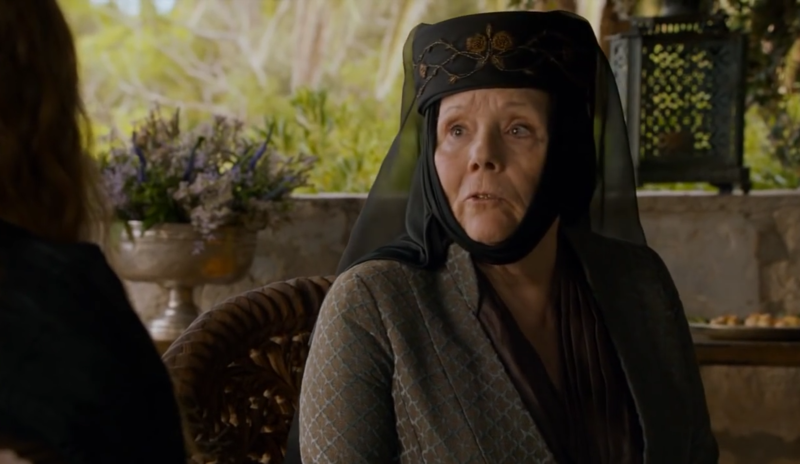 Maybe the crazy-rich Lady Olenna had only one black headdress for times of mourning. Maybe the simple embroidered roses reminded her of Margaery's final message of loyalty and love. ...she knew she'd eventually have to pay a price.